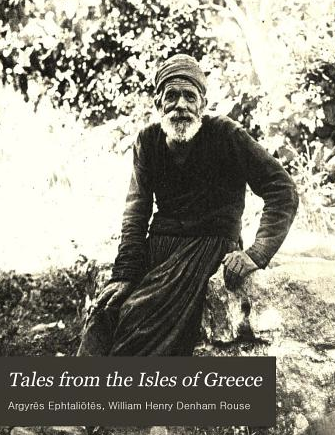 The book "Tales from the Isles of Greece: being sketches of modern Greek peasant life" was translated from the Greek of Argyris Ephtaliotis by W. H. D. Rouse and was published in 1897. It is currently available as a FREE Google ebook. "The stories here offered to English readers are taken from a little book which has excited much interest in Greece. It is one of the few books dealing with their own peasant life that the Greeks of to-day have given us. With material so plentiful, and of such interest not only for themselves but for all who love Greece, we can only wonder and regret that there are so few books of the kind. One or two of the sketches in the original work have been omitted, and their place has been taken by three others given at the end, dealing with the days of the War of Independence. These have not yet been published, and have been translated from the author's manuscript. If among those that have been retained some are but slight, there is none but thoughts light upon the life and customs of the Greek peasant."